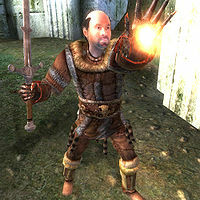 Brucetus Festinius is a Breton spellsword mercenary who can usually be found at the Roxey Inn, north of the Imperial City. He can generally be found in the company of fellow mercenaries Rigmor and S'razirr and their employer, Claude Maric. When at the Roxey Inn, which is where he will be until the related quest is initialized, he hangs out all day, eating for two hours at 8am, 12pm and 6pm, if not sleeping for 8 hours between 10pm and 6am. Brucetus has a respectable selection of spells available to him. All leveled, they include major Alteration, Illusion, and Restoration spells, as well as major and minor spells from the Destruction school of magic, and minor Conjuration spells, with the exception of Bound Weapons. When the quest is active, he and the two other hired mercenaries travel to the Ayleid ruin of Malada, where he will keep watch over their small camp, if not eating and sleeping at his usual times. In case he is still alive after the quest is completed, he will head back to the Roxey and his normal life. He is equipped with several pieces of light armor (cuirass, greaves, and boots) and wields a longsword or claymore, all of which are of the best possible quality for your character's level. At night he sleeps in a huntsman vest and a pair of breeches. Brucetus Festinius also carries a small amount of gold. When you approach him near Malada, he will, like the other two thugs, lie about his activities: "Strange ruins, huh? You'd have to be crazy to go in there. I'm just here for the scenery and fresh air". If you talk to him after handing over the carving to Claude Maric, he will taunt you by saying "Don't worry, pal, you'll get used to losing after a while." Nothing You Can Possess: Umbacano wants you to recover a decorative carving from the High Fane. Sometimes, all the beds at Roxey's Inn are occupied, forcing him to spend the night wandering around instead. Esta página foi modificada pela última vez à(s) 00h41min de 19 de junho de 2013.